I have to tell you folks, Christmas came early this year. I entered an on-line sweepstakes sponsored by Quiltmakers Magazine Blog, Quilty Pleasures promoting Quiltmakers’ new publication, Quiltmakers 100 Blocks and I WON! Yeah! What a haul. 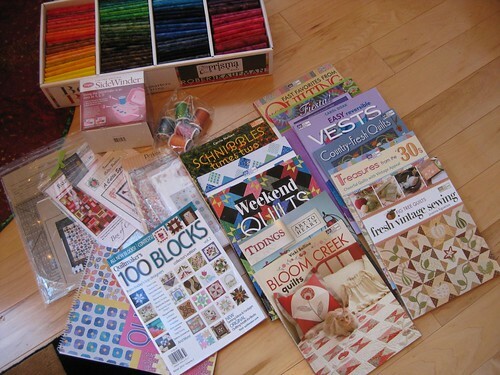 Of course there was a copy of Quiltmakers 100 Blocks , but also lots of other quilting books, patterns, a quilt calendar, template, 5 spools of Blendables thread, and 100 Kaufman Prism batik fat quarters. I have to admit, the fat quarters are my favorite. 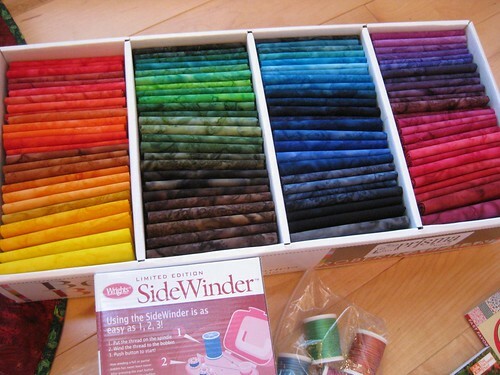 1 Response to Quiltmaker Win!